Downtown Property Management, Downtown Property Managers, Downtown, TX Property Management Companies. Call us today at 713.972.1222 or enter your address below. Why waste time searching for the right marketing channels, setting up an account and making postings yourself when you can have AREA Texas Realty & Management do it for you? Find renters faster by upgrading your marketing and advertising strategy and execution. Prospective tenants can fill out an online application through our website. Our team of property managers can easily start the screening process and fill the property quickly. Our website is powered so that we can seamlessly accept application fees, security deposit and rent payments online. The modern renter expects the ability to view property details online and to quickly apply for rent and we offer it! Want to protect your investment? Make sure to inspect. Property inspections protect property from unforeseen consequences and standard property ownership issues. Our property managers conduct regular inspections to ensure your property remains well-maintained. Each time we receive a maintenance request, we use this as an opportunity to walk through the entire property to ensure that nothing has been damaged and that the terms of the lease are being followed. Area Texas Realty & Management inspection services are included in your rental property management contract and ensure lease terms are being fulfilled and there are no property damages. Call us today to schedule a free property management proposal and learn more about our property inspection services at (713) 972-1222. A property consistently filled with good tenants can be a goldmine. Our thorough screening processes and ongoing service ensure tenants are reliable and stay that way. At AREA Texas Realty & Management we implement a very thorough tenant screaming process to avoid bad tenants. Bad tenants and renters can destroy your property, leave without paying, and cause a ton of headaches and expenses. Listed below are some of the requirements and procedure we take as property managers. Screen All New Tenant Applications– All potential tenants are required to fill out a rental application. The application must completely be filled out. Driver’s license number, social security, date of birth, current and previous address, current and previous employer, and references are included in the application. We Run a Credit Check– Credit checks are run on all tenants. AREA Texas Realty & Management does not recommended you use a tenant provided credit report, as they have their best interests in mind and you have yours. Interview Previous Landlords and References– As property managers we pay close attention to tenant’s rental history. We contact at least two previous landlords and their references. Verify Income– AREA Texas Realty & Management calls employer to verify income listed on application. Depending on the situation we might request check stubs. Perfection: THAT’S the kind of first impression you want to make. A perfect property attracts the perfect tenants, making life easier than ever for you. AREA Texas Realty & Management crafts make ready living spaces that will attract the tenants you want most. Smoke detector check or installed. Utilities transferred either to Management Company or to new tenant. Repair damages from previous tenant. AREA Texas Realty & Management does not cut corners during the make-ready process. Be weary of manager who might cut corners your run the risk of attracting the wrong tenants, longer vacancies or reduced rents. Our Philosophy: The better a property looks the better tenant you will attract. Need help moving in new tenants? Our property managers will prepare the lease, collect the first full month’s rent and a security deposit equal to one month’s rent. Our comprehensive rental property move-in services come with every residential property management package. AREA Texas Realty & Management requires security deposit and first month’s rent prior to taking processing of the property. Leave the details to us. Area Texas Realty & Management takes care of all of the move-in specifics to make sure your tenants are settled in and your investments are protected. Area Texas Realty & Management property managers will lead the tenants on the initial walkthrough of the property to explain any features and how to use them. From demoing the dishwasher to answering questions about pool upkeep, our property managers will ensure the tenants are comfortable in their new home. The tenant will be equipped with any keys, remotes, or alarm codes they will need, and Area Texas Realty & Management will design a customized property manual for clear easy access to information that outlines proper maintenance. The property manager will take the tenant through all of the necessary paperwork to answer any questions and make expectations clear, while establishing a trusting relationship from the very beginning. When transitioning between tenants, our property managers provide a smooth move-out. They will meet with the tenants for a final walkthrough, where they can document the condition and prepare for the Make Ready process. Our staff will collect the keys and check for accurate contact information and forwarding addresses to proceed with the security deposit return process. If any of the deposit must be used for repairs beyond basic wear and tear, Area Texas Realty & Management will take care of all documentation for deductions. Our professionalism and experience will ensure nothing is overlooked, affording you complete peace of mind. Call us today to request a free property management proposal at (713) 972-1222. Area Texas keeps your property running smoothly with our 24/7 maintenance services. The majority of our repairs are handled by our in-house maintenance department. This keeps cost down and ensures quality. We also have an extensive network of vendors that offer preferred pricing to our owners. Owners can rest easy knowing they can contact our contractors directly to inquire about project status. Tenants can upload images of the problem which helps facilitate the repair. AREA Texas Realty & Management can easily submit maintenance requests online via our website. We also provide tenants with an emergency repair request line. The repair requests are tracked with the technology we have implemented so tenants and staff can access information from any mobile device. This means we resolve property maintenance issues faster and keep tenants happy! Call us today at (713) 972-1222 today to request a free property maintenance proposal. No rent, no profit. Fortunately, Area Texas has streamlined the rent collection process for tenants and owners. We offer your tenants five easy ways to pay rent, allowing owners to collect rent faster and more efficiently than if rent payment options were limited. Once we receive the rent, we send you the deposits through a secure online rent payment system created with our partner, Chase Bank. Both you and your tenant benefit from such a quick and simple process. When collection goes sour, we handle that, too. Standard services include FREE evictions when we place the tenant. If rent is not received by the due date state on the renter’s lease agreement, we access your rental property to post a 3 day notice to vacate. The tenant is then given 3 additional days to comply before our AREA Texas team files a petition to evict your tenant for you. All of these services come standard when you hire us to manage your rental property. Call us today at (713) 972-1222 to learn more about our rent collection services and electronic deposit system for property owners. Area Texas Realty & Management gives owners accounting that ensures peace of mind. Owners can manage their properties efficiently and effectively with our accounting technology. Our software tracks everything and our accounting services are comprehensive. AREA Texas Realty & Management knows the importance of collecting and dispersing funds. Our top priority is to provide the most outstanding service to our owners and residents. That’s why we use the most convenient and efficient property management software for accounting, billing, and invoicing clients so you can get your rent on time without a hitch. Owners can securely access information about their properties at any time and from anywhere. Sensitive data is securely housed in a state-of-art data center, and backed up regularly and automatically. Monthly owner statements are delivered online. Easy-to-read owner statements can be accessed online using our convenient online Owners Portal, saving you time and paper. Owner documents are online and can be accessed 24/7. We conveniently provide tax documents, leases, vendor invoices and copies of work orders. All owner funds will be sent via direct deposit by no later than the 10th of the month. If funds have not been collected by the 6th of the month we will notify owner immediately and start with eviction process. We’ll manage all of your property’s accounting, billing, and invoicing so you can don’t have to. Call us today at (713) 972-1222 or fill out our contact form today. Our Technology sets us apart from our competitors. We invest in advanced technology to provide you the best service and manage your properties efficiently and effectively. Our top priority is to provide the most outstanding service to our owners and residents. Your monthly owner statements are delivered electronically. Easy-to-read owner statements can be accessed online using our convenient online Owners Portal, saving you time and paper. Owner documents are online and can be accessed 24/7. We conveniently provide tax documents, leases, vendor invoices and copies of work orders. Your payments are sent electronically and securely. We’ve partnered with Chase bank to create a system that streamlines owner payments via online ACH (electronic payments). This system allows owners to get their payments faster. Shorter vacancy time with our enhanced marketing strategies. We create aggressive advertising ads to our extensive client database. The ads are designed by a professional designer and stand out from the crowd. We promote your listing to other realtors through the multiple listing services (MLS) and to the public via har.com and rentals.com. Online applications are available for potential residents, making it easier to attract more prospects. Start maximizing your rental investment’s potential! Get a Free Rental Analysis & Rent Report and learn how much rent you can be getting for your rental property. Thank you for your interest in AREA Texas Realty and Property Management. We’re a full service Houston realty and property management company with over twenty years of experience in sales, leasing and property management, we know the Houston market and we know Real Estate. Our mission is to diligently oversee your property from vacancy to tenancy and beyond, all for one inclusive management fee. We are licensed realtors and veteran property managers. Above all, we are committed to exceeding your expectations. 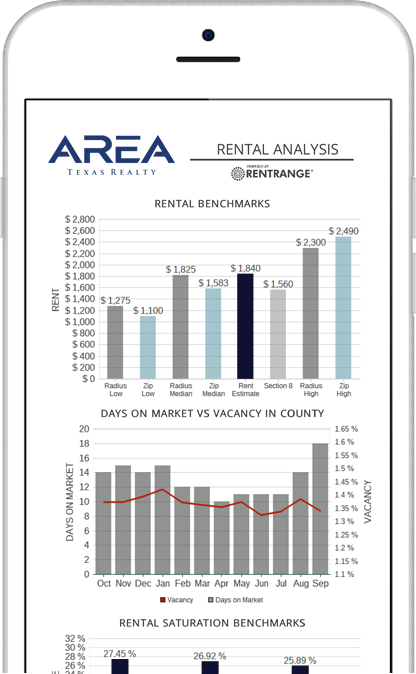 Get started with your FREE RENTAL PRICE ANALYSIS or call us directly at 713.972.1222. Our number one goal is cultivating a long term, mutually beneficial relationship with you. We believe if the standards are high and the work is cost-effective, everyone benefits. Our team of property managers is committed to lasting relationships, and that starts with taking care of your property to the highest standards. Contact us to learn more about our Houston Property Management services and fees. We will be more than happy to prepare a quote for you. Smooth and efficient management— no matter what. The BEST customer service. PERIOD. Downtown is the largest business district in Houston, Texas, located near the geographic center of the metropolitan area at the confluence of Interstate 10, Interstate 45, and Interstate 69. The 1.84-square-mile (4.8 km2) district, enclosed by the aforementioned highways, contains the original townsite of Houston at the confluence of Buffalo Bayou and White Oak Bayou, a point known as Allen's Landing. Downtown has been the city's preeminent commercial district since its founding in 1836. Today home to nine Fortune 500 corporations, Downtown contains 50 million square feet (4,600,000 m2) of office space and is the workplace of 150,000 employees. Downtown is also a major destination for entertainment and recreation. Nine major performing arts organizations are located within the 13,000-seat Theater District at prominent venues including Alley Theatre, Hobby Center for the Performing Arts, Jones Hall, and the Wortham Theater Center. Two major professional sports venues, Minute Maid Park and the Toyota Center, are home to the Houston Astros and Houston Rockets, respectively. Discovery Green, an urban park located on the east side of the district adjacent to the George R. Brown Convention Center, anchors the city's convention district. Downtown is Houston's civic center, containing Houston City Hall, the jail, criminal, and civil courthouses of Harris County, and a federal prison and courthouse. Downtown is also a major public transportation hub, lying at the center of the light rail system, park and ride system, and the metropolitan freeway network; the Metropolitan Transit Authority of Harris County (METRO) is headquartered in the district. Over 100,000 people commute through Downtown daily. An extensive network of pedestrian tunnels and skywalks connects a large number of buildings in the district; this system also serves as a subterranean mall. Copyright 2019 Area Texas Realty & Management. All Rights Reserved.